We hear Jesus's words and want to respond, but so often we feel we're too busy, too anxious, or too heavily burdened to take hold of his invitation. 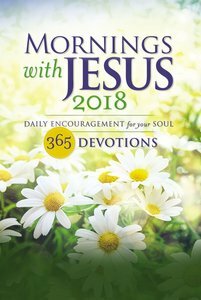 Mornings with Jesus 2018, an annual, 365-day devotional, is your entrée into his world. Jesus will comfort you, and you'll experience the delight and challenge of knowing him and living for him. In Mornings with Jesus 2018, you can read and reflect on one all-new devotion each day that will encourage you to embrace Jesus's love, to lay down your worries and walk with Him, and to focus on Him as Redeemer, Friend, and Faithful One. Lifting up their voices in heartfelt gratitude, ten writers consider the character and teachings of Jesus and share how He enriches and empowers them daily and how He wants to do the same for you. Every day you will enjoy a scripture verse, reflection on Jesus's words, and a faith step that inspires and challenges you in your daily walk of living a Christ-like life. About "Mornings With Jesus 2018"
was created by the trusted editors of "Guideposts," a monthly inspirational magazine with a circulation of more than four million readers.